We sell International truck parts to help with your restoration projects. With an expert staff who not only give you personable customer service, but truly have a passion for these old treasures, Old International Trucks is your one stop shop for your antique international truck needs. While you're here, check out the owner George's collection of antique International trucks. If you're looking for inspiration for your next project, we've spent years collecting old photos and advertisements from the early days of International trucks. Check out our online store to find what you need, or feel free to give us a call to get parts information or advice. Hundreds of people looked through and learnt about the large collection of international motor trucks Saturday morning, for the Kirkham International Motor Truck Collection Open House. What started out as a family business later developed into a major hobby for George Kirkham, who opened his large collection of International trucks to the public for them to see and learn about the evolution of International trucks. For decades Kirkham has been helping people with their restoration projects on International trucks through locating parts and giving them photos or live examples of what the originals look like completely restored. What started as a one-truck passion project grew into the impressive Kirkham International Truck Collection. “The Kirkham collection started out as one little red pickup truck and we have grown over the last 30 years from one to around 60 trucks and a few trailers,” says Kirkham. Being an International truck dealer, he was able to get access to the trucks he was wanting, along with Kirkham restoring a handful of the trucks in the collection himself. As the hobby grew stronger with Kirkham, there was a need for more space to properly store and maintain — and as the collection grew, so did the warehouse. The collection continued to grow, grabbing the title of the largest collection of International trucks in western Canada, and the second largest in the country. “When we first started opening up to people in 1998, we only had about seven trucks at the time so it has grown a lot, but we were always doing shows and parades,” says Kirkham. Kirkham has always invited people into his collection to look through, climb on and learn about the massive collection that he has dedicated his life to. His experience with the International truck community has helped him be able to teach everyone from people restoring trucks, to people who just want to see them all about the history, evolution and significance off all of the trucks. The open house viewing of the Kirkham Collection had expanded hours in the morning to allow more people to observe it without over crowding as over 300 people view it each time. The motortruck collection is open to the public about four times a year and is also available for private functions. For more information on The Kirkham International Motortruck Collection, visit oldinternationaltrucks.com. George is an International truck restorer and historian, with over 30 years experience as an International Truck Dealer. He’s very involved in the preservation of the trucking industry, and is an active member in IHCC (International Harvester Collectors Club) and ATHS (American Truck Historical Society). 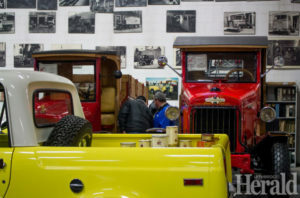 With over 60 restored International trucks in his collection, many of which were restored by George personally, he has a vast knowledge of International history. International has been a large part of the Kirkham family. George Kirkham Sr., George’s father, worked for International Harvester Truck Company for 40 Years, and George Kirkham Jr. has owned his dealership for over 30 Years. George’s passion has lead him to teaching others about the history of International, spreading the joy of his hobby and helping others with advice and information whenever possible. Errol has 49 years of experience in the parts business, 40 with International trucks and 7 with Southland International. He started his career in Moose Jaw, Saskatchewan at the International dealer in 1965. In ‘68, he moved to the Dodge dealer and three years later he joined the Saskatchewan Department of Highways as a senior stores keeper. In ‘77 he moved to Langley, B.C., where he served as parts manager until 1981, when he joined Foot Hills International as Parts Manager. In 2007 he relocated to Lethbridge, AB, joining Southland International Trucks as Parts Manager. Errol’s knowledge of the older International Trucks has helped grow our antique truck parts business. Shelby started assisting with restorations when she was just 9 years old, helping restore a 1959 International A-100 Golden Jubilee, 50-year Anniversary edition. At 15, with the help of her father George, they completed their fastest frame-off restoration to date – a 1960 B-100 International short box pickup. Just a couple months after her 16th birthday they completed the restoration. Shelby started working for Old International Trucks in July 2011 as a parts technician. She now handles the digitizing of old advertisements, truck photos, and colour charts, along with managing the parts catalog and website. As an active member of ATHS and IHCC, Shelby is helping preserve the history of The International Harvester Company along with the trucking industry.